The Mid November 2015 Issue of Practical Welding Letter, Bulletin 114, dealing with online Resources on Welding Sheet Metal (NEW) was not distributed by e-mail but it is available at Bulletin 114 and from the updated Welding Resources Page. This issue is this year's last one. It is the 148th, which means that quite a lot issues were published to date. As long as readers pick them up and browse through them, they may hopefully find something interesting, and possibly useful for their professional activities. We start this issue by reporting on a special camera to be used as a viewing aid. Using weld viewing camera recorded images on large monitor display gives students vital examples that help understanding what may go wrong in automatic welding and why faulty welds occur. On another subject enlightening cues are given on how brazed specimens should look for passing visual inspection. An ongoing effort is exerted to come up with new and improved silver free brazing alloys for reducing consumables cost while assuring acceptable mechanical properties of brazed joints. Those using currently silver alloys consumables may benefit by trying and testing alternative filler metals. 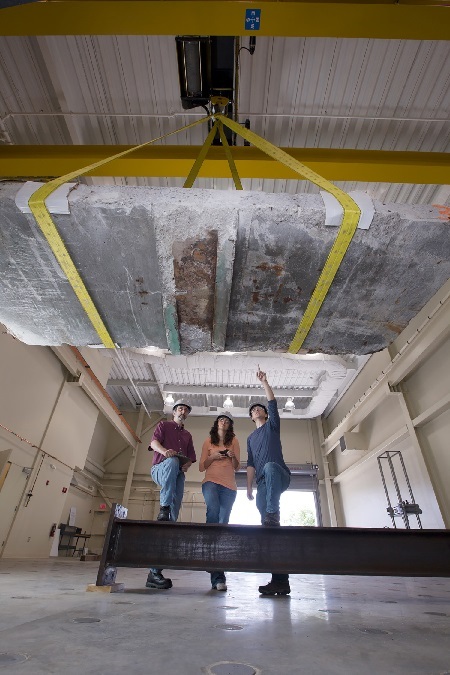 The Mechanical Properties Laboratory is changing. At least for those involved in tissues raised or made and collected for use in the human body. It is interesting to follow recent efforts and results, to keep informed on continuing progress, even for professionals not involved in some of the most advanced testing procedures being developed for biotechnology. The new official issue of the ASM Thermal Spray Society publishes a few articles and much information on recent progress in old and new application procedures. Interested readers are urged to seek it and to review whatever may help them perform their duties successfully. Recent applications of spray technology have passed severe service conditions tests and demostrated their cost effectiveness in fulfilling critical requirements. Another reported article reviews new ways to apply diamond like wear resistant coatings on demanding applications for the automotive industry. The application reported is designed for a specific mass production need. If successful, it will not take much time until commercial spin-off will be available for general use. It is hoped that most of readers will find at least something interesting in these pages. Let us know what you would like to find here. The next issue will hopefully be released at the beginning of the new year. Until then Practical Welding Letter wishes to all the readers to enjoy the coming year end festivities in peace and in good health. The other regular columns can be found at their usual places. Readers requests, comments or feedback are welcome as well as original articles reflecting practical experience of their authors. Please use the Contact Us form to send us your mail. Keeping Inspection Technology in Pace with Weld-Industry Advancements. The author stresses the importance of The Reliable Eye: "Despite all of the modern inspection technologies in today’s welding industry, unaided visual examination continues to be the primary method to control satisfactory welding. An experienced set of eyes remains the key performance indicator for ensuring weld quality before, during, and after the weld process. Visual examination is fundamental to ensure joint fitup, setting and marking hold/check points, and checking for base metal discontinuities and cleanliness." However, during the welding process itself, viewing the weld through the helmet filter, though possible, is still difficult. A major improvement in the capability to observe the process in action is now available. Note: - We are not recommending nor endorsing the specific camera mentioned in the article. Maybe similar instruments are available on the market. Readers are urged to check for themselves if the items mentioned are likely to meet their own needs and purposes. "Specialized wide-dynamic range cameras provide valuable information during the welding process. New digital camera technology along with software is able to take different exposure values of the bright arc and compile them into one homogenous, viewable image". This is a substantial improvement allowing operators to control welding quality in the making, especially in automated processes. Adjusting process parameters or shutting it down if necessary may save valuable time and materials. Recording capabilities of the camera permit the inspector to review the process and verify acceptability. Showing selected sequences of a live weld arc to a classroom of welders in training can have important educational value. "Using weld viewing camera video images on large monitor display gives students vital examples as to why welding defects may occur. [The instructor] can show students on a display monitor what improper arc shapes and colors look like, bad alignment of the electrode/torch in relation to the welding joint, and the pool formation and size". It is quite likely that operators of semi automatic arc welding processes who ran occasionally into problems because of poor control could benefit by adopting the viewing camera presented in the article or a similar one. In any case it may be worth checking. Interested readers are urged to seek the source, pointed at above. 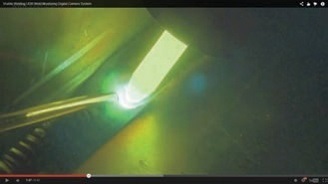 Live weld viewing images of the gas tungsten arc welding (GTAW) process. The electrode and feed rod are clearly visible to ensure alignment during filler passes. A well known brazing expert, Dan Kay, who takes turns with other colleagues in answering queries in a Q&A page regularly published in the Welding Journal, offers his suggestions in an article published at page 68 of the November 2015 issue of that Magazine. The article explains why a small meniscus, concave fillet, is an indicator of sound brazing, although it cannot show the conditions in the interface. On the contrary a large fillet should be avoided. It also explains why FPI (Fluorescent Penetrant Inspection) should not be performed to inspect brazed joints, as unable to provide useful information. The article is a fine example of a nice piece, plainly written by an expert whose knowledge makes him an authority in the profession. It is worth reading for everybody. Readers who work with brazing are urged to seek the original article. (image from AWS Brazing Handbook, fifth edition). Using silver free brazing filler metals can be quite important economically if the strength and quality requirements of brazed joints are met. 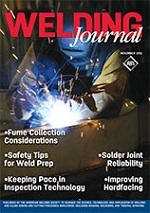 The November 2015 issue of the Welding Journal shows at page 62 an article summarizing the experimental evaluation of two commercial material used for brazing copper and brass. The shear strength of the brazed joints made with the proposed filler metals was compared with that of two silver containing brazing alloys and with another silver free one. Although the shear strength of silver free brazements is lower than that obtained by using the standard B-Ag1 silver based alloy, it is suggested that the same load capacity can be achieved by increasingproportionally the overlap to reduce costs while meeting strength requirements. Wetting and spreading characteristics were found acceptable for all materials, while some differences were remarked. The microstructures were analyzed and no intermetallic layers were found. In conclusion the materials tested, silver free filler metals for brazing copper and brass, were found adequate for the combinations tested. Interested readers are urged to seek the original article, pointed at above. Arc Seam Weld is that made by an arc welding process. Braze Metal is that portion of a brazement that has been melted during brazing. Concave Fillet Weld is that whose face has a concave shape. Double-U Groove is a double sided weld groove formed by the combination of butting members having double-J edge shapes. Flanged Corner Joint is a form of corner joint in which the butting member has a flanged edge shape at the joint, and an edge weld is applicable. Groove and Rotary Roughening, in thermal spraying, is a method of surface preparation in which grooves are made, and the original surface is roughened and spread. Horizontal Welding Position, groove weld is that in which the weld face lies in an approximately vertical plane and the weld axis at the point of welding is approximately horizontal. Joint Welding Sequence is the order of making welds. 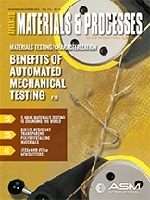 An Article titled Five ways Materials Testing is changing the World was published at page 22 of the November/December 2015 issue of Advanced Materials and Processes, an ASM International publication. The article reports on innovations in the field of material testing, brought about by aggressive studies, performed in Academic departments, that foster the need to test the mechanical properties of new delicate materials researched in biomedicine and medical treating. Mechanobiology aims to test mechanical properties of very small things like a cell, a cornea, a sheet of cells or a small piece of engineered tissue. Regenerative medicine needs ways to test materials that act like native tissue in the body. The field of developing new plastics is in an era of intense research as new materials are needed to meet new requirement that cannot yet be met by existing materials. Extreme testing conditions must be duplicated for assuring that the needed properties are known with the accuracy that must be present if successful new design has to be produced. In civil engineering, whatever can sustain stress and strain at high levels, needs to be characterized and tested in extreme conditions like high temperature or excess moisture. Security and sustainability of structures must be assured for all events. One of the challenges is to mimic collapse in simulated environment duplicating the forces that operate in a major earthquake or tsunami. To reach this goal means understanding materials behavior at atomic and molecular level. Replaceable Components capable of absorbing shock are studied for implementation in structures. Components of this type seem to be used by the Japanese to protect high rising constructions in case of earthquake. In biomedical polymer research, mechanical testing is essential for developing better materials for ligament repair. Simulating conditions in the human body means using micro-test systems measuring low forces and minimal displacement, in wet test environment as in real life. In tissue engineering Hydrogels (See box in Section 9) are developed because of the potential of these materials to mimic the body. In another laboratory working on solving medical problems, attention is focused on developing suitable adhesives for reducing injuries to fragile skin. Testing priority is to understand the most critical point of failure. While developing reinforcing structures capable of being attached to a failing but beating heart in the body wet environment, one needs to understand and measure extension, compression and active forces. For all of the challenges described, suitable laboratory testing equipment has to be invented, built and tested. Professor Jerome Hajjar of Northeastern University, left, confers with students during a materials test. The Pages of this Month cover two different subjects. The new website page covers the subject Welding-certification, in any of a list of different specializations, reported in the page, which is the passport to any meaningful welding job. Young people just starting their learning and training would do well to study from the beginning of their career which certifications make sense for their own ambitions, and start planning a way to reach them. The new page shows a few useful links, internal to the website or from the outside, that should help novices to find their way in the wealth of information available. The basic fact remains that achieving a Certification is most important for any future advancement. The above page is reachable with a click on Welding Certification. In the Resources page, links to several online Sources on Welding of Sheet Metal are available, some of them to commercial companies that we don't recommend or endorse, but whose information may anyhow be useful. It is hoped that welders engaged in this kind of welding could benefit from some of the tips. This page is available by clicking on Bulletin 114. For the complete list of such lists of references on a wide variety of welding subjects click on Welding Resources. 9.1- Aging (heat treatment) is a change in the properties of certain metals and alloys that occurs at ambient or moderately elevated temperatures after hot working. Or a heat treatment (quench aging in ferrous alloys, natural or artificial aging in ferrous and nonferrous alloys) or after a cold-working operation (strain aging). The change in properties is often, but not always, due to a phase change (precipitation), but never involves a change in chemical composition of the metal or alloy. 9.2 - Boring means enlarging a hole by removing metal with a single or a multiple-point cutting tool moving parallel to the axis of rotation of the work or tool. 9.3 - Cast structure is the metallographic structure of a casting, evidenced by shape and orientation of grains and by segregation of impurities. 9.4 - Die is a tool, usually containing a cavity, that imparts shape to solid, molten, or powdered metal, primarily because of the shape of the tool itself. Used in many press operations (including blanking, drawing, forging, and forming), in die casting, and in forming green powder metallurgy compacts. Die-casting and powder metallurgy dies are sometimes referred to as molds. 9.6 - Flake is a short, discontinuous internal crack in ferrous metals attributed to stresses produced by localized transformation and hydrogen-solubility effects during cooling after hot working. In fracture surfaces, flakes appear as bright, silvery areas with a coarse texture. 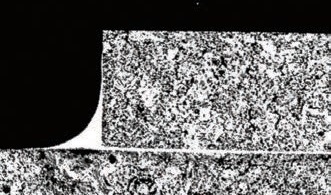 In deep acid-etched transverse sections, they appear as discontinuities that are usually in the midway to center location of the section. Also termed hairline cracks and shatter cracks. 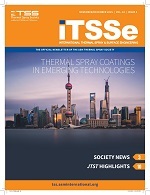 The new official newsletter of the ASM Thermal Spray Society, called International Thermal Spray and Surface Engineering (iTSSe), was attached as an insert in the November-December 2015 issue of Advanced Materials and Processes (AM&P), a publication of ASM International. The article describes in some detail the corrosion challenges facing oil platforms partially submerged in the sea. In particular are at risk the so called splash zones subjected to repetitive wet and dry cycles. While traditional protective means, consisting in Monel sheaths or in complex plastic coatings have been in use for decades, recently the industry has begun using thermal spray aluminum (TSA) coatings (more cost effective), to protect steel structures in the splash zone. After extensive testing and long time experience TSA is now recommended in NORSOK and NACE documents. It should be acknowledged that TSA coating must be performed using rigid requirements under strict controls. All the preparatory conditions must be met and the accepted parameters must be maintained. The article describes a case study by providing all the parameters adopted, and describing the severe inspection schedule used for assuring the required quality. Part II of this article is due to be published in the February 2016 issue of iTSSe. Enhanced diamond-like coatings boost fuel efficiency. 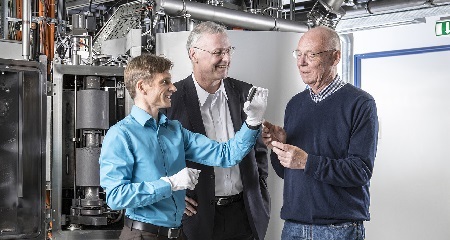 The article reports on an innovative process, developed at the Fraunhofer Institute, Germany, based on a laser arc method that applies layers of carbon almost as hard as diamond at high coating rates and with high thickness. The process is aimed to be used in the automotive industry to reduce fuel consumption. The tetrahedral amorphous carbon coatings are significantly harder and thus more resistant to wear than conventional diamond-like coatings. The process is performed under vacuum as a laser pulse initiates an arc by striking a carbon cylinder cathode. The plasma, made of carbon ions, deposits those on the workpiece (anode). In the industrial process developed by the research, "a pulsed laser is vertically scanned across a rotating graphite cylinder as a means of controlling the arc. The cylinder is converted evenly into plasma due to the scanning motion and rotation. To ensure a consistently smooth coating, a magnetic field guides the plasma and filters out any dirt particles". This promising technology has been adopted by BMW that works intensively on its industrial scale implementation. Other details and contacts can be found in the article. Well, I must first of all thank you for all the newsletters that you have sent me, and for sharing knowledge. This is a wonderful sign of the people on the other side. Thanks for the service you are providing the welding community. I have a better picture of the gentleman on the other side of the email now and can see where all of the knowledge is coming from. I am a middle-aged welding engineer, working for the offshore oil and gas industry. Currently in Norway. [...] Thank you for sharing your wisdom with the community. We invite you to participate in the IV International Scientific-Technical Conference "Welding and Related Technologies: Perspectives for Development", dedicated to the 50th anniversary of the Department "Equipment and Technology of Welding Production" (ETWP) of the Donbass State Engineering Academy, Kramatorsk, Donetsk region, Ukraine. Lately our inbox received a few messages that puzzled me. There is a very short introduction of the inquirer, and possibly some indication of general interest. But I cannot find any question. So what is the purpose? What am I expected to answer? My first impulse is not to answer at all. No question - no answer. So if you are interested in learning welding in general, you should know that this website, www.welding advisers.com is dedicated to spread information on welding. As I already wrote to my readers several times, a good place to start from could be the Site Map page. If you get it on your browser's screen, you have easy links to all pages at your fingertips. Start reading and learning. And then ask your precisely formulated questions. I had the privilege to suggest a few unconventional solutions to welding problems in the past. It is only natural that I am interested in knowing what came out of my suggestions in practice. That is for my personal satisfaction if the idea was indeed adequate, and for having the chance to improve it if the first shot proved lacking. I am asking to let me know, because it is most interesting to me. Unfortunately, this aspect of human curiosity is mostly ignored by the recipients of advice.